SAP Ariba Spot Buy: Powered by Mercateo Unite. SAP Ariba, one of the world-leading providers in procurement solutions, has become part of the Mercateo Unite network. SAP Ariba teams up with Mercateo as primary partner to roll out its Spot Buy solution in Europe and will onboard its suppliers through Unite. Mercateo Unite complements SAP Ariba’s Spot Buy process with its unique supply side reach in Europe. 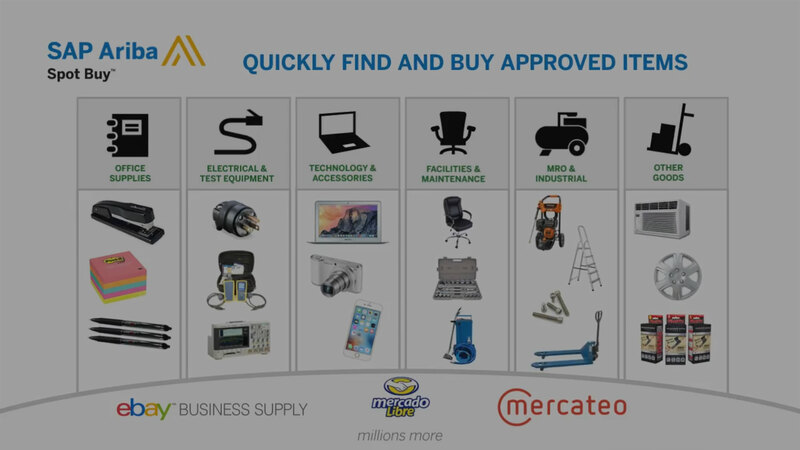 With SAP Ariba’s Spot Buy guided buying process and the Mercateo Unite multi-supplier infrastructure, enterprise buyers can access the rapidly growing number of Mercateo Unite suppliers as well as millions of items from Mercateo Shop on demand. SAP Ariba’s guided buying process and unified user experience is leveraged across the wide range of assortments and suppliers of Mercateo Unite, reducing maverick buying and process costs for the entire enterprise with the click of a button. If an item isn’t listed in a company’s catalog, users can search the SAP Ariba Spot Buy catalog to locate it. The Mercateo Unite multi-supplier network does not only offer a wide range of items but enterprises also benefit from cost control for a hard-to-manage category of spend, procedures that comply with their companys’ policies, invoicing from a single creditor and easy onboarding of suppliers. Sellers can easily reach out to a global network of buyers who spend billions on indirect goods and services every year and offer their goods when and where they are needed.